Bundengan is an endangered musical instrument from Indonesia. It has a distinctive half-dome structure, which is originally built by duck herders and used as a cape to protect themselves from adverse weather when tending their flocks. To pass their time in the fields, the duck herders play music and sing. The illusive sound of the bundengan is produced by plucking a set of strings equipped with small bamboo clips and a number of long, thin bamboo plates fitted on the resonating dome; see Figure 1. The clipped strings and the long, thin bamboo plates allow the bundengan to imitate the sound of the gongs and kendangs (cow-hide drums) in a gamelan ensemble, respectively. Hence, it is sometimes referred to as the poor-man’s gamelan. Examples of the bundengan sound can be found from: http://www.auralarchipelago.com/auralarchipelago/bundengan. Figure 1. The construction of the bundengan (left). A set of strings with small bamboo clips and a number of long, thin bamboo plates are fitted on the grid (right). 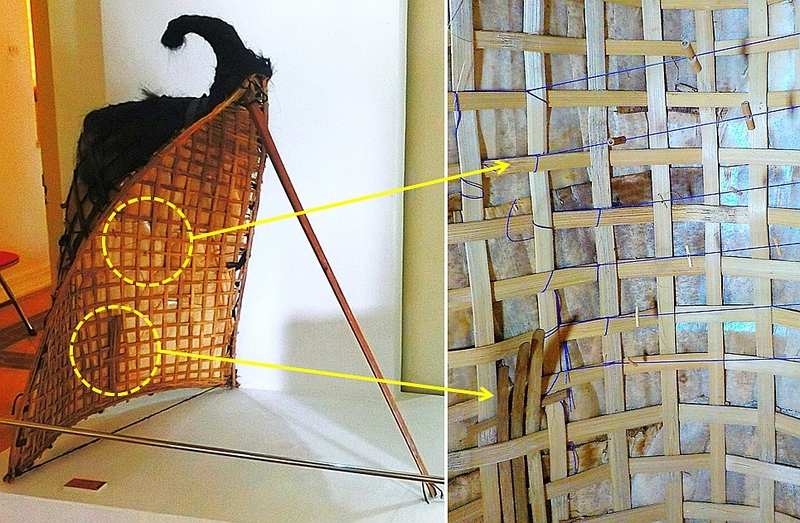 Amongst the components of the bundengan, arguably the most intriguing are the strings. We use computational simulations to investigate how the clipped strings produce the gong-like sound. By building a finite element model of a bundengan string, we visualize how the string vibration changes when the number, size (hence mass), and position of the bamboo clips are varied. We first simulate the vibration of a 20 cm string, first with no bamboo clip and then with one bamboo clip placed at 6 cm from one of its end. Compared to the string with no clip (Figure 2a), the addition of the bamboo clip alters the string vibration (Figure 2b), such that two vibrations of different frequencies emerge, each located at different sections of the string divided by the bamboo clip. A relatively high frequency vibration occurs at the longer part of the string, whereas a relatively low frequency vibration occurs at the shorter part of the string. This correlates well with our high-speed recording of the bundengan string vibration; see http://ugm.id/bundengan. Figure 2. 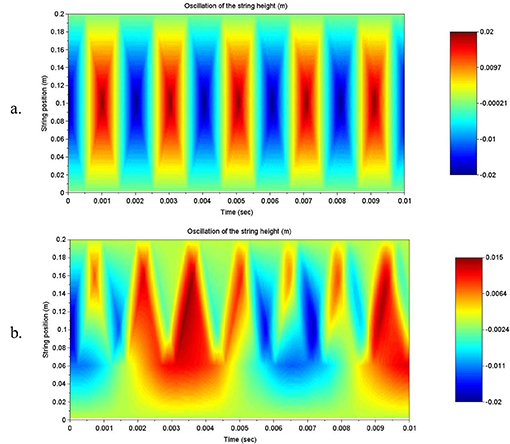 Contour plot of the bundengan string vibration when plucked at the centre of the string for (a) no bamboo clip, and (b) one bamboo clip located at 0.06 m.
We also simulate how the position of the bamboo clip affect the frequencies of the string vibration and, hence, the sound produced by the clipped string. Figure 3 demonstrates that, for the string with a bamboo clip, we have two strong peaks at frequencies lower and higher than the frequency of the peak when there is no clip. The magnitudes of these two peaks change as the clip is shifted away from the end of the string, changing the pitch of the sound. Figure 3. Frequency spectra of the bundengan string vibration when the location of the bamboo clip is shifted from 1 cm to 9 cm from one end of the 20 cm string. The spectrum for the string with no clip is also given (top graph). In a bundengan string equipped with bamboo clip, the emergence of the two different-frequency vibrations at different sections of the string is the key to the production of the gong-like sound. 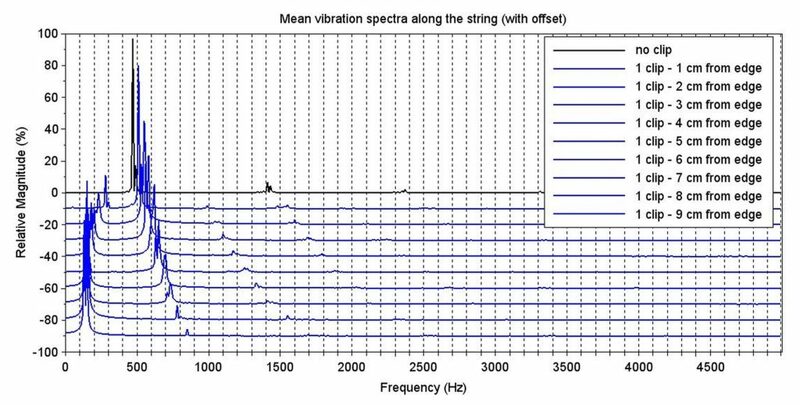 The vibration spectra allow us to understand the tuning of the bundengan string due to the position of the bamboo clip. This can serve as a guide to design the bundengan, providing possibilities for future developments.